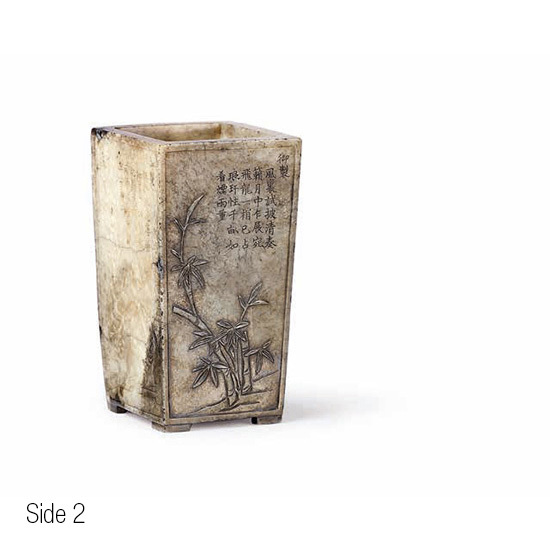 The brushpot is carved from a hollowed block of jade with tapered straight sides and rests on shallow bracketed feet. 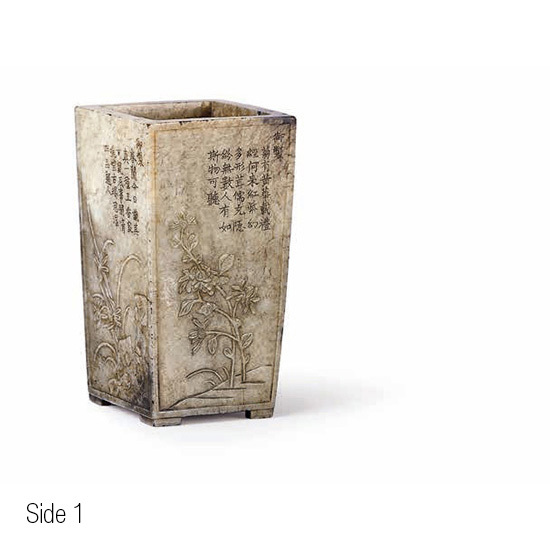 The brushpot is carved in low relief with four panels, each depicting a floral scene within a thin raised border. The four panels depict the so-called ‘four gentlemen’, which comprise prunus, orchid, bamboo and chrysanthemum and stand for dignity, quietude, fortitude and simplicity. Each floral motif Is paired with an accompanying inscription. 何來紅紫幻多形 So whence came these reds and purples in so many magically changing shapes? 人有如斯物可聽 If there were but one man like them, he’d be someone worth heeding! The title of the poem is Mantiju 漫題菊 (Impromptu Verse on Chrysanthemums) in Yuzhi shiji 御製 詩集 (His Majesty’s Poetry Collection), Second Collection 二集 (Wenyuange Siku quanshu 文淵閣四 庫全書ed. ), 44:10a. 一種王香㝡可親 Is expressed in a kind of kingly fragrance giving utter delight. 朅思澤畔品題人 How is it I chance to think of those who at the edge of a marsh appraised things so? The title of the poem is Chunlan 春蘭 (Spring Epidendrum Orchids) published in Yuzhi shiji 御製詩 集 (His Majesty’s Poetry Collection), Second Collection 二集 (Wenyuange Siku quanshu 文淵閣四庫 全書ed. ), 8:21a. 月中乍展宛飛龍 And when bathed in moonlight suddenly unfurl to become soaring dragons. 千畝如看煙雨重 A thousand acres of them look like layers of mist and rain. The title of the poem is Ti Ni Zan hua zhu 題倪瓚畫竹 (Inscribed on A Painting of Bamboos by Ni Zan) in Yuzhi shiji 御製詩集 (His Majesty’s Poetry Collection), Second Collection 二集 (Wenyuange Siku quanshu 文淵閣四庫全書ed. ), 7:4b-5a. Ni Zan 倪瓚 (1301-1374) was one of the four great masters of the Yuan dynasty. 墨勾不襲補之翁 The inky hooks follow not the style of Old Man Buzhi. 喜語難工苦易工 Where happy tidings mean hard work but distress is easy to do. The title of the poem is Mei 梅 (Prunus) in Yuzhi shiji 御製詩集 (His Majesty’s Poetry Collection), Second Collection 二集 (Wenyuange Siku quanshu 文淵閣四庫全書ed. ), 40:13b. Yang Wujiu 楊無 咎 (1097-1171) personal name (zi 字) Buzhi 补之, but some sources give Buzhi as Yang’s given name (ming 名); Yang was a renowned Southern Song era prunus painter. The jade is of a mottled opaque grey colour with black and white speckled inclusions.